The only reference to Chanukah , or Hannukah, in most bibles is where it is recorded that Jesus went to Jerusalem to celebrate it. ( John 10 v 22-23 ) The story of the events it celebrates is found in the book of 1 Macabees in the Apocrapha. The Apocrapha can be found in Roman Catholic Bibles and in one version of the New English Bible. Chanukah falls on 25th of Kislev on the Jewish calendar; in either November or December on the western calendar . Chanukah is also known as the Feast of Lights or the Feast of Dedication. In 165 BCE the Greek empire, under Antiochus IV Epiphanes imposed Greek culture, philosophy and religion on Israel and throughout the empire. (Hellenism) They built an Image of their god Zeus on top of the Temple altar and desecrated the temple by sacrificing pigs. This fulfilled a prophesy in the book of Daniel. The abandonment of Jewish customs was enforced by terror. A revolt led by Judah Macabee, in the manner of all GOD's miraculous deliverances, was successful in driving out the Greeks and the temple was cleansed and rededicated. However, it was found that there was only sufficient purified olive oil to light the Menorah ( seven branch candelabra ) in the Temple for one day and it would take eight days to purify further supplies. However, the Menorah ( lampstand) burned miraculously until the fresh supplies were ready. Chanukah is celebrated for eight days, although normal work is permissible. The main celebration is the lighting of candles, or lamps in every home, hence the title Feast of Lights. A nine candle holder (The Chanukiah ) is used, with an one extra candle being lit every day. 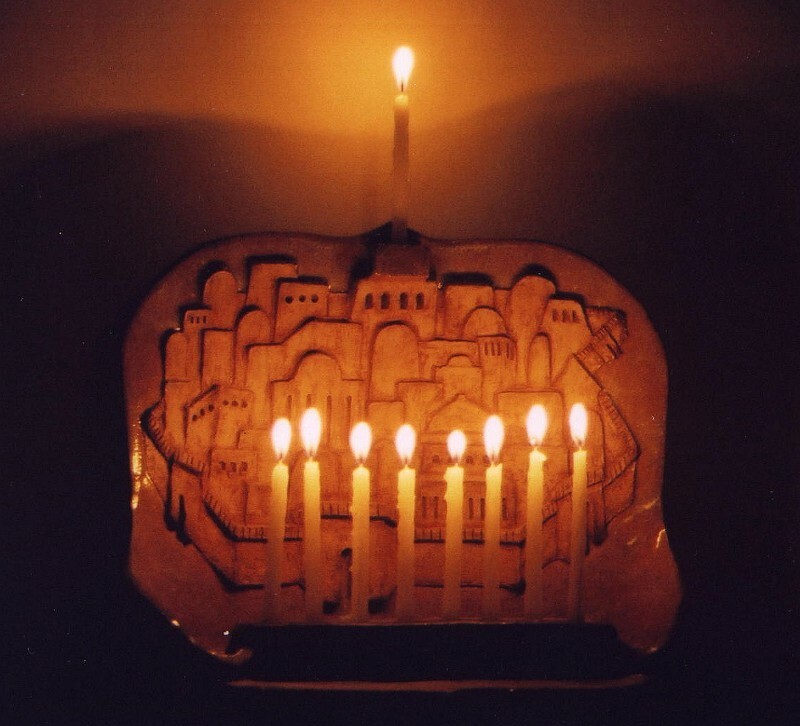 The ninth candle is called "the servant" ( ha shammash ) candle and is used to light the other eight because the eight are set apart solely for the purpose of showing that you are commemorating the miracle of eight days of light provided by GOD to rededicate the sanctuary. (The "servant candle" is interesting to the Christian who remembers the suffering servant, messianic prophecies and the fact that he came to be the light of the World. See Isaiah 9 v2, Isaiah 42 v6, Isaiah 49 v6, Isaiah 60 v1, Luke 2 v32, John 1 v4 & v9, John 8 v12). The holiday is celebrated with foods which are cooked in oil, especially doughnuts. Children play with a driedel (spinning top) which has letters which represent words, on the four sides. NESS means miracle, GADOL means great, HAYAH means happened and SHAM means here. The letters also stand for Yiddish words meaning take, give, half and put. These are instructions for a game played with the driedel and small piles of sweets, betting on the fall of the top. It has been pointed out that Christmas would not have been possible without Chanukah. (if the Greeks had succeeded in destroying the Jewish faith) It is also interesting to observe a parallel in the pressure that is being exerted today by politically correct society on the Christian church to water down its message. The Chanukiah would be a much better symbol to celebrate the season than a lot of reindeer, Christmas trees and Santa Claus. How strange that believers in the Jewish Messiah should hope to win Jews to belief in a saviour with a Greek name. I would highly recommend the teaching from Rabbi David Fohrman on Aleph Beta. There is so much more to be learned from this story. The events recalled at Hannukah ocurred in the "inter testament" period and are not included in the canon of the Hebrew scriptures; although it is present in some Christian Bibles in the books of the Macabees. Does this mean the story is unimportant? No, merely that the events ocurred after the canon of Hebrew scripture had been fixed. One parallel concerns the "burning but was not consumed" that applies to the oil in the Hannukah story (sometimes dismissed as fanciful) with the burning bush where Moses met God, that was "burning but was not consumed"
Another concerns "God can save whether by many or by few" that appears in the Macabees story and in the story of Jonathan and his armour bearer. Rabbi Forhman also draws out other lessons including the less happy fact that the fight was not simply between the Jews (Macabees) and the Greeks, but between Jews and Hellenised Jews, plus the Greeks.